I have been busy making more of the small bags with a small teddy in the front pocket. And I thought it would be nice to make some more in blue and cream because they are so pretty. Well, here are 3 of the new bags, each with a fluffy teddy in the front pocket of course. These small bags, just like the pink ones, or the cream and sparkle ones, measure approximately 6 inches long by 5.75 inches wide, with comfy shoulder/carry straps which are around 15-17 inches long. Little fluffy bears are nice and chubby, with moving arms and legs, and measure approximately 5 inches from the top of the head to the bottom of the feet. As you can see, the front pocket, being large enough to take a 5 inch chubby teddy, is also suitable for providing extra space for other small items and the bags are roomy inside too. These little blue and cream bags with teddy bears in will be available at Christmas markets this year (and if I get time to make a few more, may also be on Etsy or Ebay). Prices of each bag with teddy at markets and fairs is £5.00. If I post some to Etsy, they will cost more, owing to posting, packaging and processing charges. I think these little bags are so sweet with their teddies inside. And I hope you like them too. Posted on November 25, 2018 November 20, 2018 by Silvi VealePosted in Little Bags, Shoulder Bags, Teddy in a bagTagged Children's bags, Crochet Bags, fluffy teddy, Shoulder Bags, small bags, small teddy. Sweet small teddy nice and warm with his soft scarf and matching turquoise basket to sleep in. On my previous post about my Multi Coloured Lilac Baskets With Teddies Inside, I said I was making some turquoise ones as well. Well here they are. This small, 5 inch teddy is wearing a lovely warm scarf in soft turquoise yarn to match his turquoise-mix basket. Just like the other baskets in this style, with small, 5 inch teddies inside, the price of these baskets with their teddy is £4.00 each at markets and fairs. And once I have a few more made, I will post them online in the Elephant Sun Dog Etsy Shop too. I hope to update this page when I do so. In the meantime, if you are in the Portsmouth UK area, please come along to our markets and fairs to see all of our teddies in bags. Posted on November 24, 2018 November 18, 2018 by Silvi VealePosted in Christmas Fairs, Teddies in Baskets, Teddy in a bagTagged all ages, Children's bags, Christmas Fayres, Crochet Bags, small bags, small teddy, Teddy Bags, Teddy Baskets, Turquoise. Sweet teddy with his lilac multi-coloured basket and matching scarf. My small crochet baskets with teddies inside are very popular, so I have been adding more colours to the collection. I’ve already shown you the New Small Teddies in Baskets in Pink shades, and now here are new baskets in lilac and lovely bright multi colours. All small crochet baskets in this design and with a small, 5 inch, teddy wearing a matching scarf, are priced at £4.00 each at markets and fairs and will soon be posted online too (of course, postage and processing costs will have to be added to online sales). I am now making some in turquoise multi-colours, so will show them to you too, when they are completed. Since making these little cradle bags for teddies, I have been asked if I would add them to an online store, as well as take them to Christmas Fairs. So I have made some more in turquoise mix and lilac mix yarn and have posted 2 on Etsy and 2 on Ebay, as between them, these sites cover most craft items and toys. 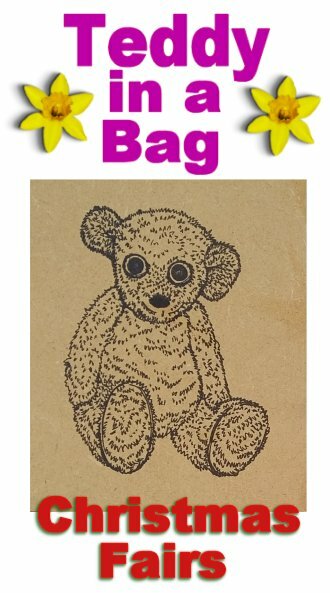 The prices on both sites are £6.00 per cradle bag with teddy inside (wearing a scarf, of course 🙂 ) and there will be no further cost for postage, packing and processing. Crochet Cradle Toy with A Small Soft Teddy Inside – for the Turquoise mix basket with teddy. and Small Soft Teddy sitting in its own crochet swinging cradle toy – for the Lilac mix basket with teddy. Toy Crochet Cradle Swing with A Small Soft Teddy Inside – for the Turquoise mix basket with teddy. Please note: These are not the same teddies and cradles. Each listing is for a different teddy and basket, even though the colour mixes are similar. Posted on November 20, 2018 November 20, 2018 by Silvi VealePosted in Cradle Bags, Hanging Cradles, Teddy in a bagTagged Children's bags, Cradle Bags, Ebay, Etsy, Hanging Cradles, Lilac, small teddy, stocking fillers, tiny bags, Turquoise.